The oldest building of St. Petersburg! 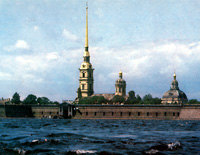 In the middle of the fortress there is the Peter and Paul Cathedral, a church where all the Russian Emperors and Empresses from Peter the Great to Alexander III are buried. The Cathedral was the first church in the city to be built of stone (in 1712-33). The design of the cathedral is most unusual for a Russian Orthodox church (come over to St Petersburg and you will learn why). On top of the gilded spire is an angel holding a cross. This weather-vane is one of the most prominent symbols of St Petersburg. At 404 feet the cathedral is the highest building in the city. Other buildings in the fortress house the City History Museum and the Mint, one of the two places in Russia where coins and medals are minted. All building are closed on Tuesdays.